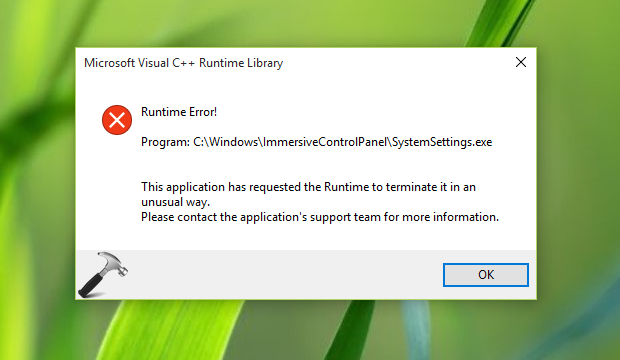 If Settings app freezes/crashes with "This application has requested the runtime to terminate it in an unusual way" error on your Windows 10, fix it here. As we all know Windows operating systems (OS) are shipped with some pre-installed Visual C++ Redistributable Package(s). The latest OS i.e. Windows 10 is shipped with Visual C++ 2010 Redistributable Package. These packages are required to run the Desktop programs/apps created using Visual Studio, and more importantly when your machine doesn’t have Visual Studio installed. 1. Press + E to open File Explorer. In the left pane, click This PC. Now in the ribbon, click Uninstall or change a program. 2. 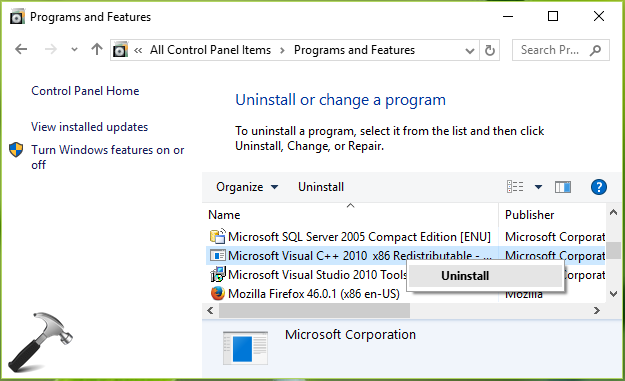 Next, in the Uninstall or change a program screen, from the list of installed programs, look for Visual C++ Redistributable Package(s). Highlight them one-by-one and each time do a right click, select Uninstall. Close the window. 3. Use following links to download latest version of Visual C++ Redistributable Package(s) from Microsoft. Make sure you download an upgraded version as compared to the one you uninstalled above. 4. The download gives you an .exe file on which do a right click and select Run as administrator. 5. This will launch the setup and you’ve to accept license agreement first and then click Install. After few seconds, you’ll get Setup successful message. Click Close and restart your machine. After rebooting the machine, the error will no longer appear. This did not help me. I am getting this error when I right click on a file in Windows Explorer. Removed 12 older redistributes and installed a later one. After rebooting the same error occurred when trying to open more than one windows explorer screen. Worked for me.Thanks a lot.You’re the best..!! I could´t find newer versions for Visual C++ 2005 – 2008 ( i have 5 2005 redistributable versions and 4 versions for 2008) so i didnt touch them. is there anything more a can do?